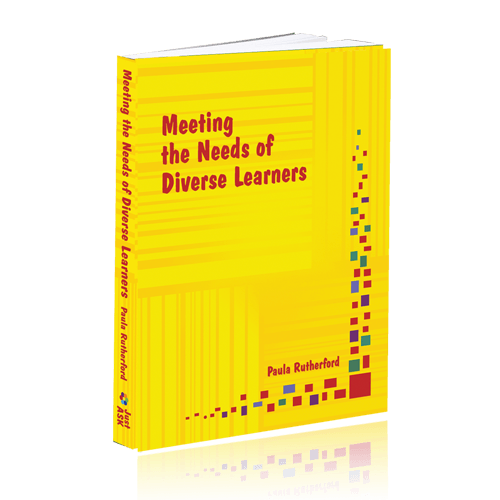 Meeting the Needs of Diverse Learners is designed to help teachers build skillfulness in recognizing, respecting, and responding to the needs of the wide range of diverse students in today’s classrooms. This book provides an array of strategies for use with gifted students, English Language Learners, and students with special needs. The author’s background as a general education teacher at the secondary and elementary levels, coupled with a graduate degree in special education and years spent working with students with learning disabilities, sets the stage for a clearly articulated belief in teachers and learners and for realistic and practical approaches to our work. Tools and templates are available online or on a CD-ROM. This chapter examines how standards-based education and differentiation can be used together to promote appropriately high levels of achievement for all students. This chapter explores the similarities and differences in our learners and provides insight into how they are likely to respond to classroom instruction. This chapter provides options for meeting the needs of the wide range of students in our classrooms, including gifted students, struggling learners, students with special needs, and second language learners, and for addressing some familiar scenarios we all encounter: students who give up, students who do not do homework, students who are disorganized, students who already know what we want them to learn, etc. This chapter presents over 40 strategies for supporting and extending the learning of our students. The information is research-based and supported by practical examples of classroom use. This chapter includes additional strategies and examples for supporting and extending the learning of our students with an emphasis on vocabulary development, reading, writing, speaking, and listening in all content areas.